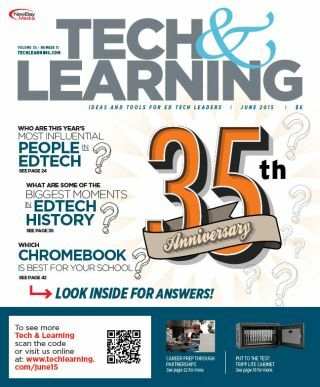 Tech & Learning (T&L), published by NewBay Tech & Learning (T&L), is celebrating its 35th anniversary this year with a series of high-profile events and magazines designed to tackle today’s issues while recognizing T&L’s three-plus decades of covering and analyzing the industry. Notable happenings include the release of the popular “Most Influential List", the 8th Semi-Annual SchoolCIO Summit, the 2nd Annual Best of Show ISTE 2015 Awards, and the marking of T&L’s 35 years which will be celebrated at ISTE 2015. “In September 1980, Tech & Learning first began its publishing life as Classroom Computer News. Looking back to 35 years ago, we have to marvel at the changes we’ve seen and ask, where did it all begin? We are excited to explore the history of this great industry and celebrate our anniversary at ISTE 2015, taking place June 28–July 1" says Kevin Hogan, Content Director. • Tech & Learning’s June Issue features the annual Most Influential List for 2015. Selected by the editors and advisors, these are the people who will affect the nation’s classrooms over the next year, and the issue has become a must-read throughout the industry. • The SchoolCIO Summit, taking place June 26-27, brings over 60 top leaders from the country to the Franklin Institute to partake in panel discussions and roundtables focusing on K-12 leadership for tomorrow’s schools and the impact of emerging technologies such as mobile and cloud computing, immersive and virtual environments, STEM and much more. • Tech & Learning’s 2nd Annual ISTE 2015 Best of Show Awards provides an excellent opportunity for exposure at ISTE. T&L advisors will investigate the products from participating vendors and decide which technologies could have the most impact in schools and districts. The recipients will be announced on techlearning.com before the conclusion of ISTE 2015, and all entries will be featured in a special Best of Show Program Guide delivered to our readers after the show. For more information about Tech & Learning’s June issue and events, contact Allison Knapp at aknapp@nbmedia.com. NewBay Media is positioned at the center of the world's most dynamic industries—Music, AV/Pro Audio, Consumer Electronics/Gaming, Video & Broadcast, and Education. We connect and inform millions of constituents in these industries through our award-winning content, integrated media capabilities, and high-profile network-building and informative events. NewBay proudly serves some of the broadest BtoB professional and music enthusiast communities in the world through over 60 print and digital publications, 100 integrated web and mobile applications, 75 conferences and conventions, custom marketing services and e-commerce capabilities. Find out more at www.newbaymedia.com.